Lonny Larson at “Patriot Golf” is a professional club builder from Owatonna, Mn. His knowledge and attention to detail is top-notch and the reason I go to him for all my golfing needs. His Custom made, balanced clubs are a joy to swing! I’m an older athlete and all the sports injuries I’ve acquired over the years from playing football, wrestling etc., has all but forced me to give up the game. But since I started using the clubs Lonny puts together, my old and persistent injuries are no longer an issue. What a great confidence builder knowing I can play a round of golf pain free! With Matching Custom-fitted clubs, you learn to let the club take over, let it do it’s job instead of using bad body posturing to help control ball flight. I’d recommend Lonny Larson to anyone regardless of skill level, professional or amateur. My experience dealing with Lonny and patriot golf has been nothing short of a golfers dream come true. Dealing directly with an owner and a one on one interaction to gain the knowledge we seek as golfers is something you can’t put a price on. And the prices were exceptional as well for the quality of products and service you receive. 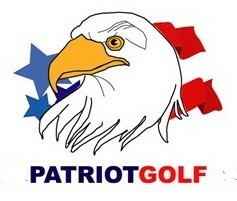 I will always use patriot golf, and refer everybody else to Lonny and the crew at patriot golf! Thanks again Lonny, what you do is a service much appreciated, take care and we will be in touch! To my friend Lonny at Patriot Golf, It is rare these days to have the support and patience you have shown. Clearly, you really care about your customers and working with them on getting the best equipment which suits their games. You have gone above and beyond in helping me fine-tune my equipment, and I sincerely thank you for your prompt and detailed responses to all of my e-mails. Once again, thank you!!! The irons went straight and sweet and I am hitting them a little longer than my old clubs. I took them to the range. I hit about 50 balls with only the 8 iron and every shot was pretty consistent. As my tempo got better, the length I hit kept increasing, plus the ball was coming off of the face so good I couldn’t even feel the impact. I think that the clubs are going to be great and all the guys said they wished that their clubs looked as good as mine, some of that came from one of the guys that just bought a $900.00 set of _____ irons about 3 weeks ago. I am still getting used to the shorter club lengths, but if I keep hitting them better and better, the length issue might be something I should have changed a long time ago. Thanks for good job you did building the clubs. When I started my search for a new driver I didn’t think it would lead me to Patriot Golf and Lonny Larson, but I’m sure glad it did. After the initial online club fitting and numerous emails, I came away with a gut feeling that Lonny wanted to build the best driver for me and have it perform like I wanted it too. Based on his recommendations, Lonny built a El Diablo driver with a Whup N Shaft and after hitting it on the range and playing only a few rounds, I can say this is the best driver I have ever hit. No more playing it safe, long and straight works just fine! I want to thank Lonny for his honest and top quality work and without any hesitation, I would recommend Patriot Golf for any of your golf club needs. With this as my first year as Long driving Professional I am grateful for the help I got from Lonny Larson owner of Patriot Golf in assisting me to get off the ground with this fantastic sport! He is very professional and helps more than is expected! Thanx Lonny! South Africa 2nd Place ReMax Long Drive World Finals in Oct. 2008. Being a rookie in the Long Drive sport in 2010, it was hard trying to figure out what exact driver head and shaft you should be using. There is no doubt in my mind that without Lonny’s help, I wouldn’t be able to continue to do well in this ever increasing sport. It was very easy and without any question, Lonny knows the Long Drive game. Thanks for all you help Lonny! Hello Lonny, At age 69 and having played golf for over 45 years, I suspect that I have spent over $50,000 buying golf clubs while trying to improve and/or maintain my game. In the past 5 years alone, I have purchased 14 different brand and different loft drivers and currently own 16 in total. These drivers were both off the shelf models and several that were custom built by professional club builders in south Florida after analyzing my swing, etc. And frankly; nothing worked. As I aged, my drives continued to become shorter and less often in the fairway no matter which club I used. The Driver Head with the Shaft you recommended and built for me has me consistently hitting long drives in the fairway like I did when I was 40 years old. And does it feel GREAT to again see the ball booming down the fairway 275 yards and hearing that sweet sound at impact. Sir; you are head and shoulders above ANY club maker I have ever met or talked to; and I have met and/or talked to many. By simply changing my drivers offset loft, shaft flex and length has made stepping up to the Tee something I actually look forward to again. You are a TRUE credit to the golfing world and to your profession. I can’t thank you enough and I hope that I have the opportunity to personally meet you someday. MIZUNO IRONS WIN THE LAST TWO U.S. OPENS. MIZUNO HAS WON MANY PROFESSIONAL TOURNAMENTS!